June 15, 2016 – The General Dynamics SATCOM Technologies team located in San Jose, California, completed the installation and testing of two 34-meter (112-foot wide) beam waveguide antennas as part of NASA’s modernization plan for its Deep Space Network (DSN). 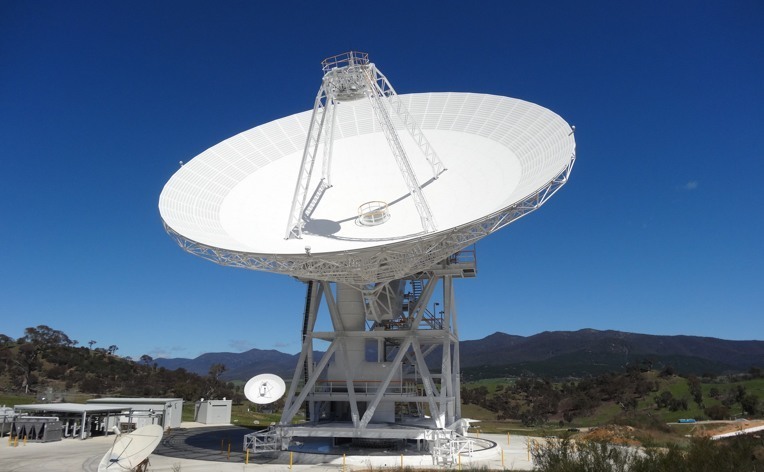 The antennas, located near Canberra, Australia, use a new servo-control system to more accurately position and point each antenna, improving communication and tracking of space probes on Mars and other spacecraft traveling beyond our galaxy. The largest and most sensitive scientific telecommunications system in the world, NASA’s DSN also helps scientists explore the universe. Beam waveguide-style antennas house sensitive electronics and systems in a room that is inside of the antenna’s ground-based pedestal. The design makes it easier for technicians to maintain the equipment as well as implement technology upgrades. Based on designs created by General Dynamics, in collaboration with the Jet Propulsion Laboratory, General Dynamics has built nine 34-meter antennas for the DSN, and upgraded 64-meter and 70-meter antennas built in the 1960s. The company also designed and delivered 25 twelve-meter radio telescope antennas for the Atacama Large Millimeter/Submillimeter Array (ALMA) Observatory in Chile and is supplying 64 specially designed antennas for a new radio-telescope array that is currently under construction in South Africa. The Jet Propulsion Laboratory, a division of the California Institute of Technology in Pasadena, manages the Deep Space Network for NASA.